She is already well known in many Island circles – from business and equestrian to sailing and charity work – but Yarmouth farmer Susie Sheldon will be making new contacts and discovering even more facets of local life, when she takes on the mantle of Her Majesty’s Lord Lieutenant of the Isle of Wight in March 2019. Having served one of the Island’s 17 Deputy Lieutenants for the past six years, it was always a possibility that Susie Sheldon might be invited to fill the Lord Lieutenant role on the retirement of Major General Sir Martin White KCVO CB CBE, next spring. In fact, she had already been ‘sounded out’ by the Cabinet Office about taking on the high-profile role as the Queen’s representative on the Island, but only received official confirmation of her appointment in October. Describing it as “a huge honour”, Susie said that she and husband Jamie had nevertheless had to think long and hard about the implications of taking it on. “It’s certainly going to be a very full-on job, and in my case will be for 15 years, as the retirement age is 75,” she explained, “but it is such an exciting opportunity to meet lots of people from all walks of life, and to find out more about all the amazing things happening on the Isle of Wight that I have yet to discover”. It will, of course, also mean planning and organising Royal visits to the Island, and welcoming members of the Royal famiy on arrival. “Sir Martin White has been brilliant and during his time we have had four or five Royal visits a year” she says. “These visits always involve a great deal of preparation and of course one of our aims is for all Royal visitors to see as many of the good things about the Island as possible. It provides some wonderful opportunities for us from a publicity point of view”. There are certain Royals who tend to visit the Island more often than others – notably Princess Anne, the Earl of Wessex and the Duke of Kent. “Prince Philip has also visited a lot over the years” says Susie, who hopes that she might get the opportunity to welcome some of the younger Royals in due course. “It depends very much on their interests, but we would be absolutely thrilled to welcome them”. The full-time nature of her new role means that Susie will inevitably step back from some of her charity work, as well as making some adjustments at the family’s Manor Farm business. “My staff are going to have to work harder!” she laughs, adding, “we’re all going to have to be that much more organised”. The farm, set on the salt marshes of the Yar estuary, was formerly known as Freshwater Farm (and listed as such in the Domesday Book). A mixed arable and livestock operation, it has been run by Susie and Jamie since 1974, and they pride themselves on having preserved the estuary in its natural state for over 40 years, treating the tidal area as a wildlife sanctuary. In tandem with the farming operation, they also run holiday cottage lettings – as well as Harwoods of Yarmouth, the largest chandlery on the Isle of Wight, plus other businesses. Jamie also happens to be Commodore of the Royal Yacht Squadron at Cowes, one of the most prestigious yacht clubs in the world – so life is rarely quiet and predictable in the Sheldon homestead. “It means we do a huge juggling act!” says Susie. “Fortunately we have a great team who help to make it all possible”. She disarmingly admits that one ‘scary bit’ of her new role will be the need for a wardrobe of new hats and formal outfits. It’s relatively easy for male Lord Lieutenants, who have a uniform to wear, but female incumbents – and 40% of the country’s Lord Lieutenants are now women – have to judge the most appropriate attire for each occasion, to which they pin their badge of office. Formal dos will often call for a hat and smart suit, but for outdoorsy events, tailored trouser suits have become generally accepted. Whilst you get the impression that Susie might be more comfortable in sailing or riding gear, she’s certainly no stranger to the world of dressing up, having previously served as High Sheriff of the Isle of Wight in 2011. During her tenure, she attended an average of one engagement a day, and these inevitably included grander occasions, such as the Legal processions in both Winchester and Portsmouth cathedrals, and the Legal Service parade through the streets of Newport with the judges in their gowns and wigs. “People looked and wondered what was going on” she said, “but it is a part of English tradition that remains very important. She also experienced Royal visits, with three of them taking place during her term of office. One of the greatest highlights of her time as High Sheriff, though, was being allowed to drive the Sandown Lifeboat in Sandown Bay – undoubtedly a huge thrill for somebody with her passion for being on the water. 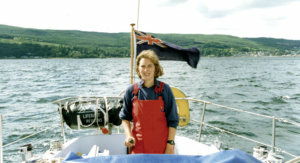 Originally introduced to sailing by Jamie, who she had met at Exeter University, Susie and her new husband launched Damsel, their Daring, two weeks after their wedding in 1974, and raced every weekend in Cowes, becoming part of a British team match racing against the Americans. Her desire for all Island children to have the opportunity to experience the thrill of the waves led her some years later to get involved in an initiative by Yarmouth Sailing Club to get a fleet of Optimists, the little starter boats for children. As it turned out, the Sheldons’ Oppie, Basil, was used by other youngsters long before their own eldest child was big enough to sail it. 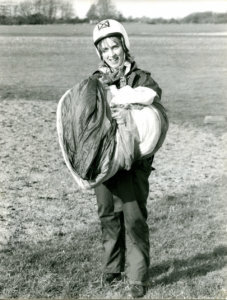 Susie also taught in their annual Oppie Week, and ran the Royal Solent Dinghy week for some years. Once they moved into Jamie’s family farm overlooking the salt marshes and the Yar, their three children, Charles, Sophie and Richie progressed from enjoying mud fights in the river, to sailing in Jamie’s father’s old boat, Palamedes. Now grown up and all living away from the Island, the children are said to be immensely excited about their mother’s new role. Eldest son Charles, who graduated from Oxford, now lives and works in London, although he has business interests on the Island. He and his wife are expecting their first child – the Sheldons’ first grandchild – and one gets the distinct impression that it won’t be too long before the new little addition to the family will be introduced to the delights of mudfights and then sailing. Along with sailing, Susie’s other big passion in life has been riding – “I’ve always ridden” she says, “though I don’t do so much now”. Over the years though, she has been Master of the Hunt, and was a long-standing Treasurer of the Isle of Wight Pony Club, as well as hosting the Pony Club Tetrathlon at King’s Manor. It regularly attracted 40 children running, shooting and then swimming in the pool. When it came to the riding bit of this four-disciplined event, some children had expensive ponies while some of them had never had a pony in their life – but they all shared. “The great joy of the Pony Club was that the children came from all sorts of backgrounds” says Susie. This inclusive, ‘all backgrounds’ view of Island life is one that she is particularly looking forward to experiencing as Lord Lieutenant.